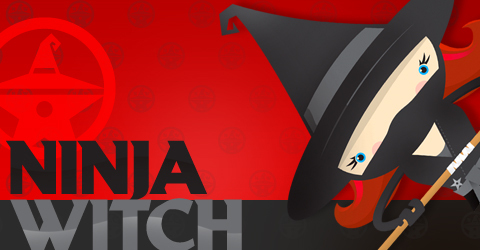 Ninja Witch’s concept was developed in 2009. She was inspired by a few different elements. Many moons ago there was a creative group of womyn who assembled and called themselves the T.W.A.T. Team (True Womyn Acting Together). They were tired of seeing the negative effects of marketing exploiting female sexuality, inequalities amongst female and male powers and gender discrimination. They recognized that our power influences our culture, our culture influences our behaviour, our choice’s, our opportunities, the next generation and the health of mother earth . They would assemble and discuss these issues and created a culture jamming T.W.A.T. zine. They were very passionate about their work as T.W.A.T. womyn however soon realized this passion was buried amongst the responsibility of life. Dedicating time to making money, caring for friend and family, pursuing education, taking care of our health, our home, our pets, our kids were all very time consuming leaving us little time to invest in T.W.A.T. passion. However this passion remained in our hearts everyday and we like to think we spread our magic in different ways everyday. In 2008 I started to learn more about energy, our own energy, the planet’s energy, nature’s energy and found it very mysterious and magical. A girlfriend and I felt very inspired to watch magic movies, research wicca and the power behind setting positive intentions. As we learnt more about the herstory of wiccans we became very sad, we morned not only all the lives that had been lost in the past of those deemed of having an association to being a witch but also all the writings that were burnt and books that were burried with these people. Most of them were womyn. Many of them believed in natural healing, reiki, setting positive intentions to heal (spells) and the beautiful powers of nature. In early 2009, I realized my fairy tale influenced childhood dreams of being married and having kids in my 30’s was not accomplished. I felt like a failure. I questioned why this life long dream felt so far away or not attainable. I woke up one morning and said “enough of these fairy tale dreams.” If I am not meant to be a mom with a prince charming and 3.5 kids then I shall create my own fairy tale: a Ninja Witch living out her burning creative feminist passions to bring back our power and influence our culture with female energy from our perspective. I started gymnastics, wall climbing and studied more wicca. So who is Ninja Witch? Ninja Witch and her Ninja Witch friends do not believe in using violence to make this world a better place. They believe in using our creative powers instead. This involves using culture jamming, positive messaging, and magic as a means to influence our society in a positive way. The Ninja Witches do not have a sword but rather a negative energy blocker shield to protect themselves from negative cultural influences and hurtful verbal communication. They believe in the powers of nature and have a garden with a soil rich in nutrients by adding compost. They wildcraft plants and herbs to help boost their immune system and fight off ill ailments such as depression, seasonal affective disorder, PMS and sore throats. They not only recycle paper, plastic, metal products and electronics but also believe products are enriched by have many different owners. For this reason they shop in thrift stores and try to buy first hand products that are not as harmful for the earth and their bodies. Ninja Witch’s philosophy is to try hard to lead a healthy life, respecting the earth, however realizes this is not always attainable whether for personal and non personal reasons. So in the end it’s all about trying what we can with what we have an not being overly hard on ourselves and others. What is Ninja Witch Working on? Creating a t-shirt line exposing the magical powers of girls, womyn and witches. The intention of this line is to influence our culture with positive and respectful messaging, empowering and protecting femayl energy. Please visit the Tee’s tab to view them. I’m excited to find out too! NinjaWitch Rocks! !